Already the relentless moon has pulled me five months away from Madison, and I don’t know if it feels like yesterday or forever. When I close my eyes, Ramona is in the backseat of the Rendezvous and we’re driving down Whitney Way towards Woodman’s grocery, or I’m beside Lake Mendota, cold September breeze and Norway maple’s bright yellow hands and the memory of my womb, full of life. I remember the rough carpet in our apartment and the hexagonal sandbox below, catalpa blooms along Lake Mendota Drive in June, the Lakeshore bike path all the way downtown to First United Methodist Church. I remember bao at Orient House on South Park and ming sabai at Sa-Bai Thong on University Avenue. So much life, those seven years, moving from newlywed into parent. Now, I am more, always expanding into newness. My poetry is more central to my life than ever as Ramona goes to preschool, five full days a week. From the chilly attic of our Greenville home, I’m writing about change and reading Chen Chen and Naomi Shihab Nye and Elizabeth Bishop; I’m applying to MFA programs, lining out my 20 best poems across the tan tile floor. Summer turns golden, and then we see frost in the morning at the school bus stop. Consistently, the days are about ten degrees warmer here than in Madison. I still check the Wisconsin weather from time to time, think about snow. I’m looking forward to winter here, wondering what it will be like. I’ve never lived so far south before, and yet still this is the midwest? The world is so large. The world is so small. This small town grows on you, its people close-knit in the small streets around the square, stitched up Beaumont Avenue and into these few hills that look out to a land of flat. The sidewalks here remind me of my hometown, the small Illinois village of my childhood, tree roots pulling up the corner of the concrete, flowers and weeds waving from every lawn. The trees here are better than our Madison apartment, where the west sun glared through the living room window all summer long. Here, our backyard is full to bursting with leaves and twigs, so shady that the grass barely grows. The tulip tree stretches taller than a four-story building. I am comforted by the age of the trees, this old house, the years that this place was home before it was our home. Our Madison apartment was a place of transience; grad school housing where we were limited to no more than eight years renting. Having lived there for seven, we were the longest remaining tenants in our building. But here, this house was the world for one woman, the space where she raised her children and lived into widowhood. This attic room was one of her children’s bedrooms, “E’s room,” according to the note on the breaker box in the basement. The house is heavy with her stories; it makes it a warm place to live. As I walk Oak street past Dairy Queen and our neighbor’s wilted garden, the burning bush still vibrant with autumn red, I find Greenville a good place to be. I hardly miss my before, my large home of lakes and liberal politics. It only takes a few months to remember how lovely a small town can be, even if it doesn’t have huge public libraries and what seems to me now endless restaurant choices. What it lacks, it makes up for in friendly faces and a sort of informality, a nonchalance about keeping up the yard and having the trendiest wardrobe. I am not anonymous here, and as someone who often chooses silence yet still wants to be seen, the lack of anonymity cheers me. I tie tiny knots one after another, hours following patterned arrows on a chart—forward knot, backward knot, one half hitch to the right and one to the left—until the colors of the embroidery floss twine and wind into patches, rows, chevron, diamonds. I spin without clock, the pattern laid before me like the strange wheel of the orb weaver in the breezeway lamp. The spider is she who creates beauty not for its sake: the beauty is incidental to the nature of the web, a hunter’s tool. And what tool do I tie in a small band of color around the wrist of my daughter, my lover, my mother? In each knot, a prayer, a thought of the other—hands at keyboards and fingers around crayons and palms on greenware clay, age spots and caresses and the wringing out of all days. In the belly of the knots, the bracelet holds the sweat of a whole summer, soap residue of every shower in which for a moment, the shoulders relax. I tie knots to bind my fingers around the wrists of everyone I love. I hunt for the caress of cotton, for 4 a.m. fast asleep, for the yes to days’ work, inexplicable. Inexhaustible. The eye catching on the color of the banded wrist—there, my small prize of pleasure. Ramona’s birth story, four years late. Four years ago today, I was two days past Ramona’s due date and three days away from “giving birth” to her. I put that in quotes because I felt, right or wrong, that I actually had no part in her birth. I’ve never shared her birth story in its entirety here on the blog. It was a horrific thing, and I know I am not alone in experiencing a traumatic birth. One of the things about trauma, though, is that it’s easy to feel like there’s no way anyone else could understand what you went through. Really, I think the only one who can understand is Zach because he was there and went through his own personal hell watching what I was going through. I’m glad I live in a day in age that women rarely die in childbirth. I try to be thankful for medical intervention because it’s possible that Ramona and/or I would not have made it through otherwise. But I can’t help feeling that I failed. I still feel it four years later, even after reminding myself thousands of times that the way Ramona was born does not invalidate my motherhood and does not make me a failure. The way in which I feel I failed was in not giving voice at any point to my objection. Once Zach and I checked into St. Mary’s Hospital in Madison, I felt my power and autonomy were completely stripped from me. We were first put in an exam room to wait for them to ready a birthing room for us. I told them I wanted to have as natural of a birth as possible and that I wanted a room with a tub. No problem, the nurse said, all our rooms have tubs. Except they don’t all have tubs. And there was only one room available for us, the one room that only had a shower. I wish at this point I would have said, “No! I’m staying here until you find me a tub.” Irrational, perhaps, but I labored for eight hours in the hospital before I asked for an epidural and waited another two hours before I received one. If I had spent–been allowed to spend–those ten hours in the exam room, perhaps by then a room with a tub would have been available, and perhaps that could have held me off from the epidural at least for a while. Instead, we took the room without the tub, didn’t raise any fuss even if I was very disappointed. It’s the first what if in the birth story. I was dilated to six centimeters when we arrived at the hospital on the night of the 19th. I asked to not have frequent checks, and through the night this was respected. Early in the morning of the 20th, they checked my dilation, and I had barely dilated any further. I think this is the moment I gave up. It is the biggest what if moment that I go back to over and over again. I was so tired, in so much pain. But what if I could have endured? What if I could have been patient? If I had given her more time, would Ramona have found her own way? I asked for drugs and then for an epidural, which I received some time after 8 a.m. The doctor told me to rest, but I was still in a lot of pain and I couldn’t sleep. When he checked in on me a few hours later, my labor was still not progressing. I was exhausted, worn thin with no resistance left in me, so when he said he was going to break my water (yes, it still hadn’t broken), all I said was, “Okay.” Again, what if? Still there was little progress throughout most of the day on the 20th. I don’t know when exactly, but some time in the afternoon, the doctor decided it was time to speed things along. He said he was going to give me oxytocin to hopefully move me from active labor into the transition stage. Again, all I could find was a placid, weak “Okay.” What if? At this point, Ramona had no choice, no time, and because of the oxytocin, increasingly no room. She became wedged in an early stage of shoulder dystocia. The doctor tried numerous times to manually turn Ramona by literally inserting his hand and rotating her head, but every time I contracted, she only got more wedged in that position. So he called the surgeon. All throughout this, I continued to have a lot of pain. Not as much as I would have had without an epidural but much more than the virtual no pain some women experience with an epidural. The surgeon assessed the situation and told us there was nothing we could do but a c-section. Ramona was too far up to be safely removed with forceps or vacuum (one of the things in her birth that I thank God for because I know how horrific that often is! ), and she continued on using scare tactics to get us to agree: “Your baby is tired. She will be in distress soon. And if you continue to labor, you could become incontinent.” I mean, really? Really? I think back to this, and I am so angry at her lack of compassion. I so did not want a c-section. Earlier in my pregnancy, Ramona had been breech and I cried many times when I thought I might not be able to have a vaginal delivery. If you’ve never given birth, I think it might be hard to understand how I felt about this. And many women have c-sections and are happy about it, and I am happy for them, without reservation. That just wasn’t me. I thought I was stronger than this. I had more faith in my body than this. My mother had fairly easy, by-the-books vaginal births, and that’s what I’d expected for myself. So I cried, and I talked with Zach, but what could we do? At this point, we were out of options. I had to have a c-section. Next comes one of the most insensitive parts of the whole birthing process. While I lay devastated and helpless in the hospital bed. the aides who were prepping me for surgery were having a race to see how fast they could get me ready and down to the operating room. I really can’t say anything else about this. To say I am angry, still angry, at their lack of compassion, their inability to even see me as human doesn’t begin to describe it. If this was the end of the story, I think I could have healed better. If I had gone into the c-section, had a normal, lucid surgery, and been presented with Ramona when she was born, I think I could have gotten over all the what ifs, I could have forgiven myself and the medical profession for the way Ramona’s birth happened. But all of what happened before the c-section is nothing compared to what the surgery was. If you’ve been given an epidural and are then taken down for a c-section, the practice is that they ramp up the dosage of analgesic and do surgery without a spinal block. They warn you that you’ll feel some tugging. The epidural had been dulling my pain to a point, but I was still having quite a lot of pain during contractions (frequent from the oxytocin). When they upped the dosage, I no longer felt the contractions. Before the surgeon begins to cut, they will test to see if the analgesic is working well by pinching you, once low on your belly and once higher. In the best case scenario, you won’t feel either of these pinches. I felt the higher one. If a woman feels only the higher of the two pinches, the surgery begins, under the assumption that by the time they are cutting at the higher position (about ten minutes in), the analgesic will have kicked in up there, too. This is only an assumption, though. Not a guarantee. For me, the analgesic did not cover the higher portion of my belly, not right away and not ten minutes later when they were cutting. I won’t go into the details here. You can imagine enough on your own. I will say that after 24 hours of labor, my membranes were very thin, and when one of them tore, the surgery had to continue whether I was in any small semblance of comfort or in complete agony. If they didn’t continue, I would lose too much blood. They did dose me up with enough other drugs so that at some point, my memory of what continues is washed away, forgotten in what feels like a hallucinogenic fog. Zach says that they very briefly presented Ramona to us before intubating and suctioning her airways (I had meconium-stained amniotic fluid–another reason for the c-section). I don’t remember it. I don’t remember the moment my daughter was born. The moment that’s supposed to be so amazing, that’s supposed to erase the memory of all the pain, and barring that, at least make it all worth it? I didn’t have that moment. I didn’t have any moment. I can’t even remember what time she was born. I always have to look it up in our records or ask Zach. It was some time between 7 p.m. and 9 p.m. on the 20th. And we are okay. Ultimately, we are okay. I just still wish it all could have gone differently, and I want all the mothers out there who’ve gone through any similar or different form of trauma during childbirth to know: you are not alone, and even if no one else can truly understand, I hope we all as mothers can stand together, because this mothering thing is not easy. It’s not easy on day one or day one thousand or day ten thousand (okay, I’m guessing on the last one, but my mom could attest to this, I’m sure). I woke quickly to this truth, maybe others wake to it more slowly. I only know my own experience. I keep reminding myself that in the end, the most important things came out okay–that Ramona and I recovered and are healthy, that we are together, and that no matter what happened on September 20, 2012, every September 20 since can be a happy one because it’s another year that God has blessed me to spend with my energetic, smart, empathetic little girl. I took my husband’s name when I got married, and I’m okay with that. When I got married six years ago, I hadn’t gone through my feminist awakening yet. Sure, I considered myself a feminist…but I didn’t fully realize the extent to which the patriarchy controlled my decisions. I wasn’t fully aware of feminist issues in my day-to-day life. I took my husband’s name happily, from a place of conservatism and lukewarm feminism, rather than from a place of careful consideration as to how taking his name would affect the women around me and the women of future generations. But here’s the thing. Since getting married, I’ve thought about my last name a lot. I’ve talked to Zach about it a lot, and we even discussed changing our name–perhaps creating a last name that was a combination of his last name and my maiden name, or perhaps having a hyphenated last name. He was totally on board with considering these options. He was willing to go through the red tape it would take to change our name if it felt important to me. Ultimately though, I feel okay with the decision I had made, although I also feel it was not and is not a feminist choice. Taking my husband’s name is not feminist. I just don’t think it is. It is an acceptance of patriarchal rule in a very blatant way: my identity is “erased” and is replaced with his identity. It symbolizes my subservience to him. But keeping my maiden name didn’t seem any better to me. Because where did my maiden name come from? My father. Where did my mother’s maiden name come from? Her father. It’s the same generation upon generation into my history: my matriarchal lines are muddled, rendered nearly untraceable by the patrilineal last name. There is no maiden name that is not traced back through the male line. Some women feel that keeping their last name is a feminist choice, or at least a more feminist choice than changing to their husband’s name. I would take their point, but there are other reasons I didn’t want to keep my maiden name. For one thing, I like the symbol of the two becoming one. I’m not only a feminist; I’m also a Christian, and I believe in the idea that a Christian marriage joins two people in sacred ways. They are bonded before their families and before God. So for me, whatever our last name was to be, I wanted us to share it. Then why not a hyphenated name? Well, this choice felt to me like simply kicking the can down the road. What about our daughter? When she got married, would she hyphenate her name again? Would she drop my maiden name? Or keep mine and drop Zach’s? The choice for her would be even more convoluted if she came into the situation with an already hyphenated name, forcing her to make the decisions that I bucked. I did consider combining our names more seriously. However, it seemed to me this choice carried with it some of the same baggage as the other choices–for instance, it wouldn’t erase the fact that my maiden name is still a product of a male lineage. Also, what choice would our daughter make if she got married? Would she combine her name with her partner’s name? If everyone suddenly decided to meld their names together into a new name each generation, any kind of lineage/family history would be very difficult to trace. I’m not really that into family history, but this does seem problematic to me. If there were a standardized method for combining names which would allow family history to continue to be traced, then perhaps this would be a viable option. But as it is, it just felt a little too wacky to me. If I had made a different decision at the time of our marriage, I would not feel compelled to now take Zach’s name. However, after weighing all my options after the fact, I also don’t feel compelled to change my name back, or to hyphenate or combine our names. Each choice has its own issues, and I am left between a rock and a hard place and another rock. I don’t think there is a really good feminist option on this issue. Did I choose the least feminist option of all? Probably. But given the number of reservations I have about all the other choices, I’m not willing at this point to change my name. As a feminist, I think we sometimes are forced to make choices that are not feminist–or if not forced per se, than at least put in a position where making the feminist choice becomes so burdensome, we just can’t pull the weight any more. Check out this comic by Ronnie Ritchie around wearing makeup. I think it speaks about this problem very well. A few days each week, Zach watches Ramona for a chunk of hours so I can bike off to the library or Panera or Starbucks to have some solid writing and reading time. 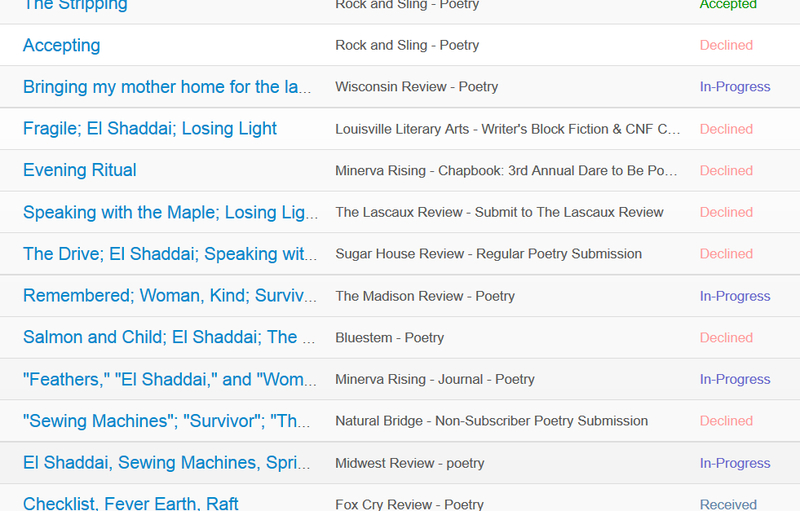 I spend much of this time reading poetry, writing and revising poetry, and occasionally blogging. Lovely, no? In the last twelve months, I’ve written somewhere around 50 poems, I’ve sent groupings of these poems to 14 journals, and I’ve had a total of four poems accepted for publication. My first thought here is that I should be submitting to more places. I’m also tempted to consider my poetry’s worth on the scale of how many “Accepted” submissions I have versus how many “Declined.” But I know such thinking is foolish. Even well-known poets have to send their work out relentlessly, over and over and over, if they hope to see it published. And so I loop back around to the thought, Send out more! Send them out more frequently! Hop to it, woman! Honestly, I don’t usually mind the rejection (though it does irk me that Wisconsin Review never updated the status of my submission from “In-Progress” to “Accepted”). What feels more important to me is the work, and I believe the work itself has value to myself, my poetry group, my family and friends, even if it’s never seen by strangers or accepted by publishers. I have this wish that every neighborhood would have a resident poet, someone who includes a poem in a neighborhood newsletter and holds readings and poetry gatherings. Because in me, there is a need for poetry, for the way it can capture a moment or a mood, the way it can express despair and beauty, the way it carefully arranges language so that in very few words, a reader can find a deep affinity with the poet. Poetry can bring us together, and it can bring us into awareness of the lives of people unlike us. And I think the writing of poetry can be powerful in the life of the poet, too, even if their work is not critically successful.